A recent article in the Wall Street Journal about the resurgence of lace being used on the runways again sparked a thought about how lace has been influential in so many ways. It’s astonishing really, when you think about it, since lace is the ultimate luxury fabric: too light and ephemeral to lend warmth or protection to the wearer, easily damaged, and the good stuff is quite expensive. The production of lace was actually something that drove the development of a new technology that ultimately proved to have far-reaching consequences not just for fashion and the textile industry, but also for computing and technology. Despite the apparel industry’s relatively laggard uptake of new technologies, fashion has actually had a long history of moving forward and being moved forward by emerging new technologies. In fact, one of the earliest inventions that helped define computer science and computers in general was a machine designed for the textile sector of the fashion industry, the Jacquard loom. Invented by Joseph Jacquard in 1804-05, the Jacquard loom was a pivotal invention for both fashion and computing. It proved to be the impetus for the tech revolution of the textile industry and an important step in the history of computing. The Jacquard loom (which is actually a misnomer, as this invention is actually not a loom, but rather a head or an attachment that can be used with a range of different looms) was the first machine which used punch cards as a control mechanism. After the ‘hanging chad’ incident in Florida during the 2000 presidential elections, we all know what punch cards are: pieces of wood or paper with holes punched in them, where the precise pattern of the holes contain data when read through a machine capable of reading them. They are a form of data storage and have been used to store computer programs. Like the voter ballots, the Jacquard loom also used punch cards that contained information, or data, about different lace patterns. Each hole controlled a needle, threaded with up to 4 warp ends (or threads). 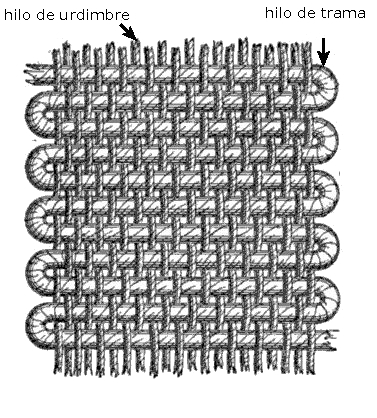 A set of punch cards might control as many as 400 needles, for a total of 1600 warp ends in a given textile, and the machine could make up to 4 repeats of the pattern across the weft. By changing out the punch cards, a loom operator could change the lace pattern which the loom could produce. This meant that looms suddenly had the ability to create many different patterns on the same loom, simply by changing out the punch cards. This was an important advance for fashion, since in the past lace had been made primarily by intensive hand methods. With the Jacquard loom, instead of a lace maker creating only a few inches of lace a day, he could now create feet and even yards of it, in some fairly complicated patterns. This was also an important advance for computing hardware. The Jacquard loom had the ability to have its program of lace pattern changed by simply swapping out the punch card sets. While the Jacquard loom machine did not perform computation using its punch cards, this is still considered an important precursor to what would eventually become the field of computer programming. The invention of the Jacquard loom had a far-reaching impact on the use of lace in fashion, as it was suddenly more affordable. There was a renewed interest of lace as a trim by the fashionable elite, and a greater number of people could wear the new machine-lace because it was less expensive than the handmade needle laces. First of course, is the issue of the actual surface. What we liked about the Corning video is the suggestion that they have a surface which could actually work as a ‘play back’ mechanism, although it is likely that wearing glass could present some challenges. Fabric is very flexible and has a great deal of give and take, and shifts on the wearer’s body in response to movement. It was remarkable tensile strength and can resist tearing even when subjected to substantial stresses (like those created over a joint when the limb is bent, or stresses created by the deformation of flesh in response to compression). Glass is brittle and while appreciable changes can be made to its underlying chemistry to make it less brittle, it would also need to be able to move over the body like cloth does, which might go beyond current material science capabilities. So perhaps Corning’s glass product wouldn’t be the best solution for the base textile, but there have been recent innovations with OLEDs (organic semiconductors) which might be suitable. What is needed is a textile (woven or nonwoven) that has the capacity to have electronic wiring incorporated throughout the body of the garment in such a way that it can receive inputs and display those inputs on the outer surface of the textile. The textile needs to be fluid enough to move smoothly over the body and to respond to the natural stresses place on it during the process of being worn, which could include abrasion and tearing stresses. The textile will also need to be able to be cleaned, or to incorporate some sort of self cleaning mechanism. There are any number of interesting innovations making their way into garments, everything from silver ions to reduce bacterial growth to the introduction of bamboo fiber, which has a natural antimicrobial which reduces the growth of microbes that cause sweat stains in fabric. There are also some interesting additions, which can help textiles shed dirt and stains more easily, as well as new ways of actually creating textiles to reduce their staining capacity. We have also seen some interesting evolutions in the required electronic circuitry – everything from metallic inks (usually copper or silver-base inks) which can be literally printed from a special ink jet printer to lay down the pre-designed circuitry to very thin copper wire used as a thread in a weave. While both of these solutions still have issues when applied to a garment, they both show merit in moving such a project forward. Some of the issues that will need to be resolved will be the ability to ensure that the circuitry doesn’t break as a result of standard wear caused by stresses in the stress areas of the garment/s (e.g., elbows, knees, seats, backs, and so on). These solutions will also need to be able to be pass garment testing, and to be able to be cleaned to industry standard testing requirements. For such a product to make it to wide-spread mass market acceptance, of course, the product itself would need to be both affordable, and the maintenance of the garment would also need to be affordable, and preferably accomplished using standard home cleaning products. Then there’s the comfort question, which we will discuss next time. New York, NY March 24, 2011 – Fashion Research Institute Publishes Latest Thought Piece: Leveraging the Power of Virtual Worlds for Collaboration by CEO Shenlei Winkler. Fashion Research Institute CEO, Shenlei Winkler, announces that FRI’s latest publication, Leveraging the Power of Virtual Worlds for Collaboration, has been published. Based on a presentation initially made in January 2008 to IBM Research North America, this whitepaper incorporates case studies drawn from FRI’s well-publicized collaborations in business, education and fashion, and focuses on some additional use cases. Leveraging the Power of Virtual Worlds for Collaboration may be downloaded from the Fashion Research Institute web site. About Fashion Research Institute, Inc.: The Fashion Research Institute is at the forefront of developing innovative design & merchandising solutions for the apparel industry. They research and develop products and systems for the fashion industry that sweepingly address wasteful business and production practices. Shenlei Winkler’s work spans both couture and mass-market design and development for the real life apparel industry. A successful designer, her lifetime sales of her real life apparel designs have now reached more than $70 million USD, with more than 25 million-dollar styles in her portfolio. Her couture work has appeared extensively on stage and movie screen.